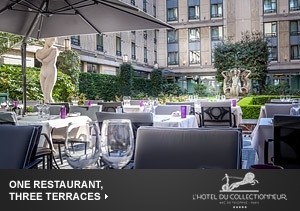 Nestled in the chic 8th arrondissement of Paris, Hotel du Collectionneur is perfectly located close to shopping, business and a short 30-40 minute drive from Charles de Gaulle International Airport. 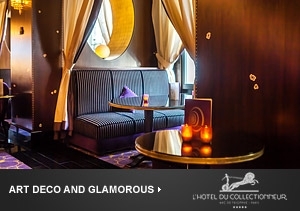 Paris is a city of plenty, and L’Hotel du Collectionneur Arc de Triomphe is certain to please its guests; no matter how diverse one’s desires may be. Luxury boutiques, trendy cafes, art galleries, museums, and business centers surround this chic hotel. An Art Deco revival takes place within its interiors, while must-see attractions like the Eiffel Tower enhance the property’s exterior. 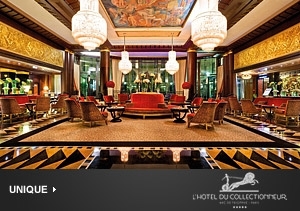 473 Rooms and Suites introduce guests to elegant Art Deco accommodation options. 88 Executive Rooms and 59 Suites include access to an Executive Lounge, where entertainment, relaxation, and delicious French refreshments are always available. Take a deep breath of scented air, gaze at L’ Hôtel du Collectionneur’s Parisian glory, and step into your favorite outfit. Or get comfortable and head out for a stroll… down the Champs Elysées, of course. 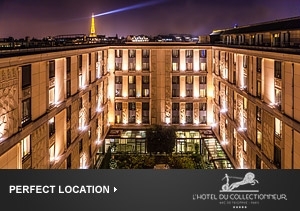 Send an availability request with your requested dates to the Hôtel du Collectionneur Arc de Triomphe – Paris. Come and discover the Superior Rooms decorated in an Art Deco Style. These rooms are ideal for either leisure or business stays. In addition to the beautiful Art Deco setting, guests can enjoy a marble bathroom and shower and free access to our spa. Features include 1 King bed, Wi-Fi Internet, minibar, safe, desk and bathrobes and slippers. Designed in an Art Deco style, our spacious deluxe rooms offer a private marble bathroom and shower and include free access to our spa and Wi-Fi Internet. With a stunning view of an Andalusian patio and 1930s-inspired decoration, Deluxe rooms offer a safe haven to travellers hoping to get away from the city's hustle and bustle. In addition to the beautiful Art Deco setting, guests can enjoy a marble bathroom and shower and free access to the spa. Designed in an Art Deco style, the spacious superior double rooms offer 2 Double beds, Wi-Fi Internet, view of the patio, the garden or Courcelles street, minibar, safe, desk and bathrobe and slippers. Situated on the hotel's high floors and designed in an authentic Art Deco style, the Executive Balcony King rooms offer 1 King bed, a marble bathroom, a desk, Wi-Fi Internet and a balcony. They are perfect for corporate clients or tourists who want to enjoy the capital. These rooms give you access to the Executive Lounge, a sophisticated and intimate workspace, where you can enjoy a meal or simply relax and take advantage of VIP services. Designed in an authentic Art Deco style, the Executive "Luxury Eiffel" rooms offer a private balcony overlooking an Andalusian patio where you can forget time and admire Paris and the Eiffel Tower. These rooms offer 1 King bed, a marble bathroom (with a separate bath and shower), Wi-Fi Internet and access to the Executive Lounge, a sophisticated and intimate workspace, where you can enjoy a meal and take advantage of VIP services. Situated on the hotel's high floors and designed in an authentic Art Deco style, the Executive Double Double rooms offer a marble bathroom, a desk and Wi-Fi Internet. They are perfect for corporate clients or tourists who want to enjoy the capital. These rooms give you access to the Executive Lounge, a sophisticated and intimate workspace, where you can enjoy a meal or simply relax and take advantage of VIP services. Designed in an authentic Art Deco style, these spacious suites offer a separate living room and a marble bathroom and shower. These suites give you access to the spa and fitness centre as well as the Executive Lounge, a sophisticated and intimate workspace, where you can enjoy a meal or simply relax and take advantage of VIP services. Designed in an authentic 1930s Art Deco style, the Deluxe suites offer a spacious living room, a bedroom with a "King" size bed and a marble bathroom and shower. These suites give you access to our spa and fitness centre as well as the Executive Lounge, a sophisticated and intimate workspace, where you can enjoy a meal or simply relax and take advantage of VIP services. Designed in an authentic 1930s Art Deco style, these suites offer a spacious living room, a room with a 1 King bed, and a marble bathroom, in addition to a stunning city view. These suites give you access to the spa and fitness centre as well as the Executive Lounge, a sophisticated and intimate workspace, where you can enjoy a meal or simply relax and take advantage of VIP services. Designed like an authentic, comfortable and refined Parisian apartment, this suite's setting is inspired by the 1930s and offers 2 rooms with "King" size beds, 2 marble bathrooms (one of which is equipped with a hydro-massage bath), a spacious living room/dining room, a kitchen and a private terrace with a view of our Andalusian patio. A double room can be added to the Royal suite to accommodate families. These suites give you access to our spa and fitness centre as well as the Executive Lounge, a sophisticated and intimate workspace, where you can enjoy a meal or simply relax and take advantage of VIP services. Situated on the top floor, this sumptuous suite opens onto a terrace with a beautiful unobstructed view of Paris and its famous Eiffel Tower. Gracefully combining comfort and sophistication in an Art Deco-inspired setting, the Presidential suite offers 2 bedrooms, a living room and a dining room for up to 8 people, in addition to 2 marble bathrooms (one of which has a Jacuzzi). These suites give you access to the spa and fitness centre as well as the Executive Lounge, a sophisticated and intimate workspace, where you can enjoy a meal or simply relax and take advantage of VIP services.